(8pcs) crab meat, cucumber, avocado. (8pcs) a roll of spicy tuna tartar, avocado, cucumber, hili mayo and tobiko. (8pcs) a roll of salmon, avocado and cucumber smoothered with philadelphia cheese. (8pcs) tempura shrimp, asparagus, chili mayo and tobiko sauce. 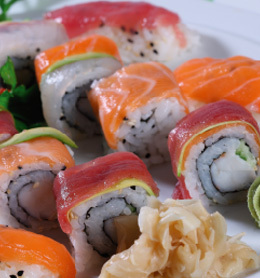 (8pcs) a roll with cucumber, asparagus and avocado topped with seared salmon or sea bass slices and drizzle with teriyaki sauce. (8pcs) cooked shrimp, cream cheese, tempura flakes roll, topped with tobiko orange. (8pcs) tempura shrimp and asparagus rolls topped with king crab meat, tobiko mix, chili mayo. 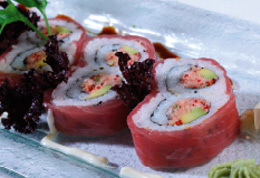 (8pcs) California roll topped with tuna, shrimp, salmon, sea bass and avocado. έχουν το υψηλότερο προσδόκιμο στον κόσμο, όπως και το μικρότερο ποσοστό παχυσαρκίας.